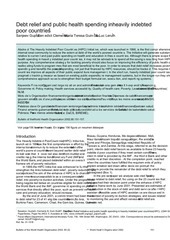 This PDF 1.4 document has been generated by Draw / OpenOffice.org 3.4.1, and has been sent on pdf-archive.com on 09/10/2015 at 23:30, from IP address 24.90.x.x. The current document download page has been viewed 260 times. additional countries are eligible for HIPC Initiative assistance. 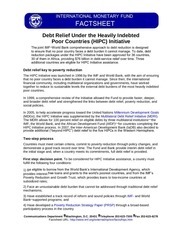 (MDGs), the HIPC Initiative was supplemented by the Multilateral Debt Relief Initiative (MDRI). provide additional (“beyond HIPC”) debt relief to the five HIPCs in the Western Hemisphere. 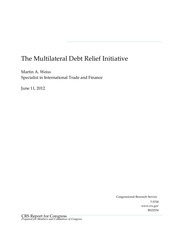 the initial stage and, when a country meets its commitments, full debt relief is provided. participatory process in the country. 3) Adopt and implement its PRSP for at least one year. receive the full debt relief committed at the decision point. eligible for HIPC Initiative assistance, have not yet reached their decision points. money needs to be spent on programs that benefit the poor. have increased markedly their expenditures on health, education, and other social services. On average, such spending is about five times the amount of debt-service payments. declined by about 1.8 percentage points of GDP between 2001 and 2013.
remaining amount comes from bilateral creditors. $75 billion in end-2013 net present value terms. funds were deposited to the IMF’s PRG-HIPC Trust. decision point, there would be an urgent need to mobilize resources. 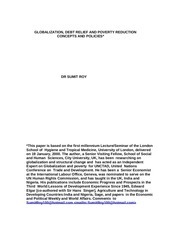 institutions, and support from the international community. 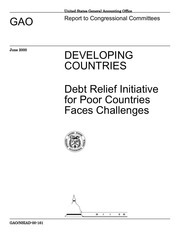 Another challenge is to ensure that eligible countries get full debt relief from all their creditors. a small share of their expected relief so far. but flattened over the past few years. Initiative and to deliver fully their share of HIPC Initiative debt relief. the HIPC Initiative during its regular consultations and other missions to creditor countries. This file has been shared by a user of PDF Archive. Document ID: 00307048.